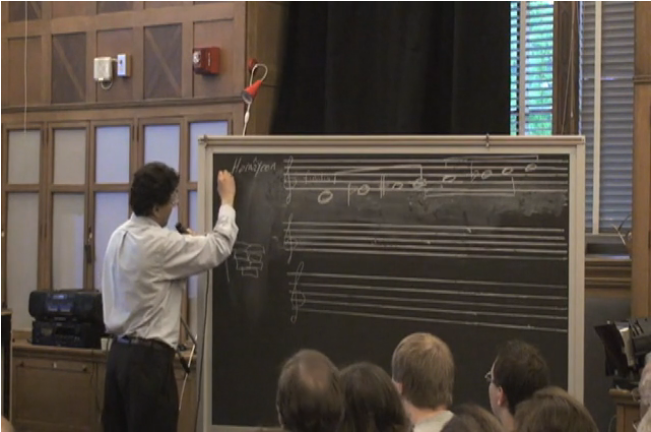 In early 2010, Professor Reza Vali lectured about the history of Persian music, presented his project Arghonoon, and then welcomed a performance by master santur muscian Darius Saghafi. Project Director Reza Vali, with Eric Barndollar, developed a computer-driven keyboard instrument that produces the sounds of Persian traditional and folk instruments using the Pythagorean tuning system of Persian and Middle Eastern music. Individual instruments in a digital Western European sound library have been manually re-tuned according to the interval ratios of the Persian modes and software that was developed to automate this process. Future plans include bringing masters of Persian traditional instruments to record samples of the sounds of their instruments for a new sound library, developing accompaniment software, and experimenting with new types of keyboard instruments (such as ergonomic keyboards) and foot pedals, to control the Arghonoon instrument in place of the present style of European keyboard.